Let go of your need to control the outcome and allow the universe to generate a solution. In general, Manatee symbolism reminds us that it’s time to slow down and swim through your emotions. Similar to the Chicken who scratches at the surface to find what is underneath, the Manatee meaning guides you to let your emotions wash over you so that you can feel what is all percolating there. By allowing yourself to feel you are also allowing yourself to move forward. Therefore, as you move forward, you release the old emotional baggage that no longer serves you. Consequently, this will open up a new wide range of possibilities for you. Trust is also a big message that manatee symbolism brings forth. When you allow yourself to move forward slowly and deliberately one step at a time, you will accomplish your goals. In other words, trust the path before you. Furthermore, you must accept the guidance that you are receiving to get you to your objectives. Like the Vulture, this creature is also reminding you to use all of your senses including the etheric ones. You will find your answers in the integration of your intuition, emotions and physical senses. People with the Manatee totem need friends around them to share ideas but feel uncomfortable in large groups. They are very open, trusting and willing. Therefore, they can also be very vulnerable. Folks with this spirit animal totem are easy-going and very trusting. Similar to the Praying Mantis, they like to take their time in accomplishing their goals. Thus they usually take the slow and steady course with conviction and courage. Often they can reduce and almost eliminate any stress in their life. When you have a manatee dream, it represents your passiveness in a situation. Alternatively, you lack ambition and drive. Moreover, it could also portray someone in your life who is lazy, slow or gentle. To dream of swimming with this animal indicates a warm and gentle personality. 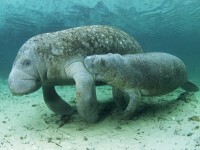 Similar to the Quarter Horse dream, multiple manatees suggest it may be time for some relaxation, and possibly even a trip to a warmer climate. There is also a suggestion of a little sadness. To dream of a dugong mother and baby advises you to be loving and soft to yourself at this time. Last night I dreamed I bought a manatee and kept him at home as a pet. Had a dream a storm had passed and i found a sweet baby manatee washed ashore. I thought perhaps it was dead but i held in to my chest and it started moving…weirdly i had a vision of a full grown manatee in the dream before this…perhaps of its mother. Anyway as i held the baby manatee to my chest i felt myself as its mother and really maternal feelings of protectiveness and caring for it….this is a dream i had after i breakup. In that relationship i learned to be gentle kind and trust as they were kinder to me that anyone had been before but in the end i felt quite alone and let down…i think this is a sign to grow and develop the tender gentle trusting innocent part of myself once again that came about as a result of this relationship…its still there. I think in time ill be able to merge wisdom and calmness with gentle kindness in a harmonious way. i dreamed one was trying to attack me. Must not be positive? Maybe I am attacking or punishing self too much, or others? NOt embracing loving feminine enough ? My sister got mad at me and hung up as I was impatient with her as she is slow and I have to repeat things many times and i get frustrated at times. Had a dream I pulled off the road to look at the water and saw a Manatee or two swimming along a river. Beautiful! I’m at Lido Key in Florida and a Manatee came up to me bumping me… Then played around me for about 20 mins… He or she surfaced several times looking at me… Then swam off.. I looked for the symbolism immediately… Thank you for the info! I had a dream last night that I was at a street parade that was along a stree that had access to the ocean. I looked out and saw a manatee gently gliding through the water and “going with the flow”. Streetside, I saw a parade float with a sandwich board that said: “Poland, EUR” and under it said: 10 years. I interpretted that to mean that the manatee set out from far away Poland and took 10 years to get where I was ablt to see it. Manatees represent softeness gentleness taking things easy. I think the dream is helping you see the beauty in the darkness..maybe you were going too hard too fast on yourself at the time of your crash. Youve learned to be gentler on your body…to slow down? Do you see the silver lining yet? I had a dream where I was on a really high bridge, looking over the edge, and hundreds of manatees were swimming under it. This helped me a great deal for today. I had a dream that I was sitting near a quiet lake and a manatee swam up to me. It was friendly as could be and wanted some of my lunch so I fed it. It also wanted some loving so I rubbed his nose and belly. It was such a calm and serene dream that I had to look further into its meaning. I always refer to this site when it comes to animal dreams. thanks for this! i drew the manatee card out of my oracle pack today and this has greater helped me to understand the message the spirits were sending me. Cool! A Manatee gave me a high 5 underwater a few days ago after rolling over and wanting me to give him a belly rub. It wasn’t a dream though, it really happened. 😛 I always look up totem meanings when I have animal encounters.